Tiger Leaping Gorge is be long to Shangri-la district, formed by two mountains(Jade dragon and haba snow mountain) and one river (Yangtz), in our Sean's Guesthouse altitude is just 1970 meter. Most trips to Tiger Leaping Gorge begin in Lijiang. A three-hour plane ride from Hong Kong, Lijiang is located in Yunnan’s Northeast and is home to the Naxi ethnic group,users of the world’s last surviving hieroglyphic language.The Tiger Leaping Gorge national park is located roughly two hours from Lijiang by taxi or private car, although buses are available from Lijiang bus station for the adventurous traveler. Sitting on the border of Lijiang and Shangri-La counties, this protected area is home to rural villages, rice terraces and an imposing mountain range that looms higher and closer the farther down the trail you go. Roughly 16 kilometers in length, the trek itself is an access path that the villagers still use today. Known as the High path, it hugs the mountainside and takes you up steep inclines, past waterfalls, through farmlands and shaded woods, before finally joining the Low Road, a modern, thoroughly tarmacked(for the most part) where buses pick up hikers and villagers alike, bringing them back to Lijiang—or taking them farther north to Shangri-La. You could plain the trekking through the uper tiger leaping gorge and the middle tiger leaping gorge. Because of the Lijiang to Shangri-la railway and highway speed are in construction(may continued for 5 years to finish) so this line of the hiking starting point chooses from Naxi family Guest house, Sean is "gold medal guide". we take drivel to Naxi then 7: 25am we start walk,the most difficult to go "28 bend ", the path is almost continuous climbing, which is the most physical exertion journey,we need to rest many times on theway. As one of the 10 most beautiful and classic hiking trails in world, today it is also called an "international trail" because of its beautiful scenery and the fact that there are no surprises or dangers.Many foreigners, people of different colors and languages, were walking with each other, and their physical strength still looked good.There are also with children, young children to challenge the spirit of hardship, through the " 28 bend ", which lasted nearly two hours to the " Tea Horse guest house " in goat foot village. Because the village pillars like goat foot comes named.11: 23am we reach to the bendiwan village at the halfway house, we took long time for lunch,after lunch, 13: 50pm departure for continued hiking, By pass dragon hole waterfalls, Guanyin Temple, all the way gently. 14 : 40pm we reach to the teacher Zhang's Inn. From the Trail of Teacher Zhang to the bottom of the gorge in the valley. The Tiger Leaping Gorge is famous for its danger in the world. The Tiger Leaping on foot stone,the Jinsha River waters stormy, the steep green hills on both sides of the Strait, and the magnificent momentum are by no means comparable to the uper tiger gorge section. After a short rest, you can climb up the ladder to the main road.To the right you can see the one line sky path. We choose to go to the "one line sky path" after a section of the cliff on the cliff, looking back is a line of days, the legend is that even the birds are afraid to go back to Xiang place. 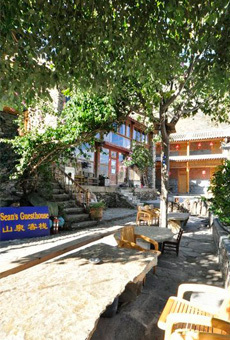 After nearly an hour on foot arrived at the village of walnut garden three groups, a few minutes by car, at 17: 30pm we arrived at the famous Sean's spring G.H.the are From the two rooms in 1983 to now can accept 80 people to stay, Sean's spring Xia is the Shangri-La tourism flourishing witness,witness and sharer person.The Guest house courtyard dam exquisite, the balcony is open, the room are warm, the meal was delicious, fluent English exchange, become countless countries in the world visitors in walnut Garden Village rest the first choice, here has the most cool balcony, as if snow-capped mountains and white clouds within reach, distant mountains, canyon scenery panoramic view.The rest chatted and rocked slowly. I heard that at night drinking and chatting on the balcony, watching the stars is the most pleasant thing, looking back the passed trail, do not pay hardships, how to know how beautiful the scenery on the road. Over looking the trail ahead, the most beautiful scenery is always on the way trekking. From Lijiang or Shangri-la we provide private car pickup or organis public bus to the city or the way to come in,we are local peoples we living inside, we know more then any other peoples,you should trust us here! the Entrance fee still the 65RMB per person, student hold card can get half discount price! if you don't want to pay the entrance fee, then you can take our 6pm bus from Lijiang to the gorge, enter the gorge by after 8pm,then you can have money for more drinking or support the village for walnut grow project. In fact this is a fantastic time to visit as there are not many visitors,especially Sean's place is very comfortable for family to enjoy the holiday, out of and away from the crowded tour group and city,Contact Sean's Guesthouse for the best choice of the family condition to book private tour in Gorge.if you book our En-suite room with touched bath and climet control room in our website, we will give you discount price 15% follow on line booking show list (except common room)! if you happy to book any ticket,we can do offline payment,you can give us your credit card number and cvv number,we can just follow your payment cost from our pos machine.warm welcome to your booking! If you happy to join trip with our other people, just see blower if some body booked the tour: for our private tour cost is follow person number and trip date number, more peoples and longer time cost more cheap, so please be understand and cooperate with us here! Trekking the Gorge high trail or beyond Gorge by trekking to Haba mountain and village, We highly suggest you to contact us to Organize the Car from Lijiang or Shangri-la all the way to Sean's G.H, Our Place located in middle gorge, we offer western style accommodation and a tour guide,most people use here to be the base camp,first rich here then doing day trip with me or my Daughter.If you need any more help just let us know here and We will be happy to help you as much as We can. You can call directly in 0887 8806829 or 15894367846! You also cold add Sean's Wechat: Realmenhere , can be easy to contact and send more photo to let you know the currently weather. If you plan to Visit the Tiger Leaping Gorge,not matter any kind of weather or story talking! Actually Lijiang and shangri-la has big raining doesn't meaning Tiger Leaping Gorge is raining. Lijiang higher than Sean's Guesthouse 500 meters, Shangri-la higher than Sean's Guesthouse 1500 meters, normally where clouds cover place could have rain, no clouds cover place can be sunny, at Sean's Guesthouse elevation is just 1970 meters, most time is sunny, even no sunny but not easy to get raining, so most time Lijiang people just make commercialize talking story to scare the visitor, but Tiger Leaping Gorge is just good enough for trekking, we are living in yangtze river side, not on high mountain or high land, don't be miss understand. You just call us to pick up you from Lijiang or Zhongdian,we have private car that take you down to the Gorge.so when you are in Lijiang,you just need to give us call: 0887-8806829 and give us your hotel contact phone number, we can arrange a pick-up service to take you directly to Sean's Spring Guest house. (Please note this service is only applicable to clients who booking Room at Sean's G.H or private package tours with Sean). In our place are very relax and we provide a few days day trips around the Middle Gorge and Haba Mountain or start your walk backwards to Qiaotou. This would be a much easier trek route and catch a connecting bus to other places (eg. Shangri-La). The 9am bus also goes pass by our Guesthouse right up to Baishuitai (White Water Terrace), Our place is a great activity spot. From here, you can stay for one week or more and go climbing the Haba Mountain.You could do a one-day trip to the big waterfall or the Middle Gorge.you can rock-climb behind Sean's! We can also organise a private car to take you beyond to Shangri-La sightseeing roundtrip. we Organize horse back ride trip around this area !. Buses leave for Daju at 8.30am and 1.30pm from Lijiang. At the moment, Lijiang to Daju or Daju to Lijiang both way, when you pass the Lijiang tourist sightseeing spot, you have to pay the entrance fee of 120RMB and "protect the old town" fee of 80RMB. When you enter into the gorge, you have to pay another gorge entrance fee of 65RMB. Therefore, most travellers opt for the Lijiang-Qiaotou route and hike up to Walnut Garden and then continue their trip to Dali or Shangri-La. The walk to the old ferry is very picturesque and should not be missed. The ferry is more reliable and the climb up the opposite bank less steep and much safer. After crossing the river from the old ferry, the path continues through the fields and houses of the local Naxi people before joining up to the road to Walnut Garden. There is link map you can copy it too: http://www.tigerleapinggorge.com/aspcms/about/about-166.html. There is a ticket office just before the Walnut Garden. Two minutes walk beyond Ticket office is Sean's Spring Guesthouse. It is a 20 minute walk from Walnut Garden to the high trail start. If you need help just call: 0887 8806829,we do pick-up service to Sean's! Any more information what you need to know, just link be lower Position Vacant menu list ! If you find this website information or the trail is satisfy, give Sean some help!